Earth. Dirt. Terra Firma. Often overlooked in landscaping design and services, a property’s soil literally provides the foundation for all land usage and landscaping and gardening itself. Without quality soil, every aspect of our land use is vulnerable. From irrigation to hardscapes, from crops to building foundations, the soil that surrounds or supports them is of the utmost importance to any structure’s durability and reliability. Without quality soil crops fail, plants struggle, support for buildings and landscaping is impinged upon and even a region’s entire ecosystem can be disrupted. Water quality can be detrimentally effected by soil runoff and nutrients for plants are inhibited. Poor soil also creates areas where undue erosion is increased, leaving landscaping and crops vulnerable to foundation changes. A good quality soil should be able to perform certain functions that are essential to people and the surrounding environment. By maintaining an area’s unique soil quality we can help ensure that the local environment benefits. At C & L Landscaping, we believe that prepping the soil before any landscaping project simply makes good sense. 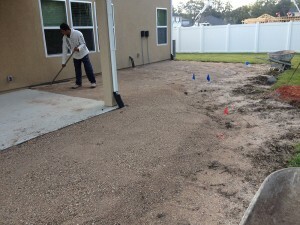 As residential and commercial landscaping experts in Jacksonville, we work to first ensure the quality of a project’s foundation with professional soil preparation. Striving to ensure a landscape design that works for your home or business for years, even decades, to come, our team at C & L Landscaping is dedicated to thorough analysis of your property’s needs.